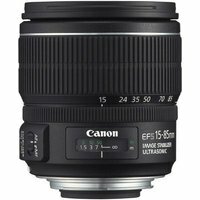 The Canon EF-S 15-85mm f/3.5-5.6 IS USM Lens is a high performance zoom lens, equivalent to a 24-136mm focal length lens (5.6x standard zoom lens). Designed for EOS EF-S mount bodies, the lens covers wide angle and portrait focal ranges. The Canon EF-S 15-85mm f/3.5-5.6 IS USM lens offers a 4-stop Image Stabiliser in addition to the 0.35m close focusing distance throughout the zoom range. Featuring fantastic low-light performance, this lens also includes ultra low dispersion (UD) lenses, aspherical lens elements and lens coatings optimised to combat ghosting and flare - meaning high quality throughout. The Canon EF-S 15-85mm f/3.5-5.6 IS USM lens also features a circular aperture for beautiful bokeh. This EF-S lens is for use with Canon DSLRs with a cropped sensor (APS-C), such as the Canon 550D, 70D, 700D, 7D etc. This lens is not suitable for full-frame cameras, such as the 5D Mark II/III, EOS 6D, 1D X.